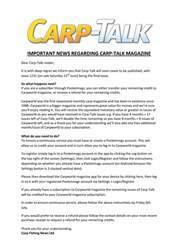 This week’s issue of Carp-Talk (issue 1023) is available to download now. 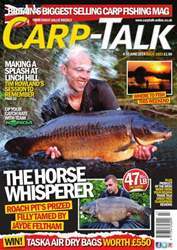 Roach Pit’s Horse, Welly’s Ulcer Fish, a 46¼lb mirror from Horton Church Lake, a Bradleys Lake record, Monks Pit’s Porky and a 44lb 10oz mirror from Emperor Lakes are all amongst the catches in this week’s issue. 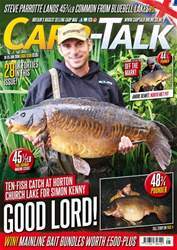 Also in the mag, Mark Bryant shows us a neat alternative to the conventional snowman rig, Mario Taal recounts his first-ever carp from Carplantis, Tim Rowland battles the weekend crowds on Linch Hill to enjoy a remarkable session, and Lee Birch gets back to the old routine of session fishing. 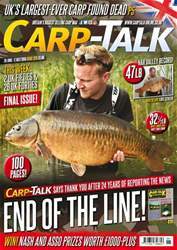 Ben Wales looks at products from Trakker, ESP, 30Plus, Atomic and Enterprise Tackle in ‘Trade Talk’. We take a look at five venues worth considering for your next session, and £550-worth of Taska Air Dry Bags are up for grabs. We’ve also got the latest Richworth and Nash Tackle monthly winners.